Research in space has given us tantalizing glimpses into the nature of life and the influence of gravity on living things. In space, scientists have been able to examine how life adapts to a different environment and thereby gain new knowledge about basic life processes on Earth. Early life sciences experiments in orbit raised many questions about how the interrelated systems of the human body and other living organisms react to microgravity. How does the human body adjust as microgravity causes fluid to shift toward the head? Do muscles and bones degrade without the force of gravity to work against? What causes some people to experience symptoms similar to motion sickness during the first few days in space while others have no symptoms? How do plants behave when there is no up or down? Do cells reproduce and synthesize materials normally in space? What are the consequences of these reactions? If responses to the space environment are undesirable, how can we prevent or control them? The Shuttle/Spacelab facilities have given scientists increased opportunities to explore these and many other questions. Investigators are studying diverse life forms from cells to whole organisms, including the human body with its many complex systems. The Spacelab module offers enough room for various experiment apparatus and an environment with regulated temperatures and pressure. To maximize scientific return, the space laboratory equipment includes modified standard medical tools, multipurpose reusable minilabs, and plant and animal habitats. Most importantly, the Spacelab module accommodates a staff of trained scientists. Life science research in space demands heavy crew involvement as expert investigators, test subjects, and laboratory technicians. Crewmembers draw and process blood samples, record their own physiological symptoms, set up and participate in a variety of experiments, tend plant and animal experiments, and carry on their work much as they do in laboratories on the ground. Detailed research in this field was very limited until the Shuttle and Spacelab made a manned laboratory in space possible. Many of the experiments performed to date have synergistic results. Physiology experiments on various parts of the body, such as the heart, muscles, and bones, are all related because changes in one part of the body cause a ripple effect inducing changes elsewhere. The human and animal studies often parallel each other as scientists attempt to determine whether the changes occurring in animals are similar to those observed in humans. If animals can be used as models for people, the number and type of studies can be increased because more subjects will be available. To help solve the mysteries of human adaptation to space, crewmembers serve as test subjects. 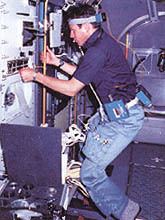 Here, a Spacelab 1 payload specialist exercises while instruments measure his heart's operation in microgravity. Crewmembers donate their blood for life sciences research. ....environment. This knowledge can be transferred to the medical and biological communities to improve the quality of life on Earth. If cells can reproduce and synthesize materials normally or better in weightlessness, some of their products that are of commercial, and pharmaceutical importance may be produced in purer forms in orbit. Many important biological molecules have never been structurally analyzed before, but in microgravity it may be possible to produce protein crystals, for example, that are large and pure enough for more precise analysis. This vigorous inquiry into the nature of life meets NASA's major goals: to ensure the safety and comfort of people living and working in space, enabling even longer stays in space, and to explore the fundamental, nature of life in the universe. Shuttle experiments have begun to confirm some generally held hypotheses and also have surprised investigators with unexpected results. At this point, we have gleaned only nuggets of information, pieces of a puzzle that must be worked out during future comprehensive investigations. The harvest of life sciences data from the Shuttle and Spacelab missions contains the seeds for more complex, long-term experiments aboard the Space Station. After more than 25 years of spaceflight, life scientists remain eager to study the body and its healthy but somewhat changed functioning in space. Through centuries of evolution, the human body has adapted to gravity's demands in countless subtle ways. In the absence of gravity, the body undergoes noticeable physiological changes: blood and body fluids are redistributed, affecting the circulatory and endocrine systems; muscles and bones begin to deteriorate; and some sensory signals are scrambled. Scientists are seeking to understand the various bodily responses to spaceflight. Many Shuttle/Spacelab experiments attempt to test or confirm theoretical explanations of how the body reacts in space and why. In microgravity, the body is in a state of "free fall" and reacts as if there is no gravity. According to one current hypothesis, the absence of gravity results in a redistribution of fluids to the upper body; this adversely affects the homeostatic mechanisms that control the cardiovascular, endocrine, and metabolic systems. A reduction of forces on the body may explain the muscle and bone degradation that has been observed in space crews and animal test subjects. Spacelab results indicate that squirrel monkeys adapt to microgravity in a similar fashion to humans. Plants may grow differently in space. Roots protruded above the soil when mung beans were grown in the Shuttle. 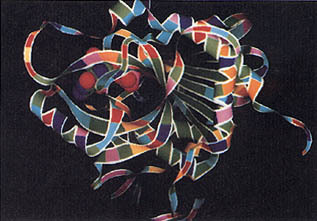 It may be possible to grow nearly perfect protein crystals in space for studies of protein structures, such as the one shown in this computer model. ...space. Scientists theorize that normal sensory and motor cues from the vestibular system in the inner ear, the eyes, and the nervous system are altered in microgravity and may conflict. For example, the eyes may send one message about body orientation while the inner ear sends another. As the person adapts to microgravity, the brain learns to reinterpret or ignore confusing signals. None of the findings to date proves that the body's responses are pathological. Some appear to be appropriate and effective ways to adapt to a new environment. Others such as the immune response and muscle and bone degradation must be studied in greater detail during longer missions. Scientists must not only identify detrimental, responses but also find ways to prevent such responses so that crews can be qualified for long-term space missions aboard the Space Station and throughout the solar system. On Earth, the parts of the cardiovascular system (the heart, lungs, and blood vessels) work together in a stable state of equilibrium. 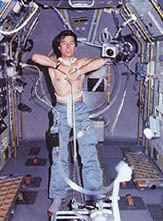 In weightlessness, blood and other fluids are redistributed to the head and upper body. In response to the fluid shift, the body's normal homeostatic mechanisms appear to adjust the operation of the heart and other parts of the body. For Spacelab research, an instrument was developed to record changes as the heart adjusts to microgravity. Called an echocardiograph, the instrument generates two-dimensional images by interpreting high-frequency sound waves directed at the heart. It was tested during Shuttle mission 51-D in April 1985 when real-time images of four crewmembers' hearts revealed major cardiovascular adjustments during the first day of spaceflight. The left side of the heart (which propels blood through the circulatory system) reached its maximum size, as did the blood volume it pumps, on the first day; the right side of the heart (which collects blood returning from the rest of the body) was smaller than when imaged preflight. By the second day of the mission, the entire heart was smaller and subsequent changes progressed more slowly. The reduction in the left heart volume remained unchanged for at least 1 week after return to Earth. From these observations, investigators concluded that the cardiovascular system adjusts quickly to fluid shifts and blood volume loss during spaceflight. Results from a French echocardiograph flown on the 51-G mission confirmed the U.S. observations on the 51-D mission. More extensive tests are needed to determine if the decrease in heart volume is associated with any reductions in heart performance. A U.S. echocardiograph is scheduled to be flown again with complementary instruments on a mission dedicated to life sciences research. Since changes in the heart appear to be linked directly to fluid shifts, it is important to track the time course of fluid shifts in microgravity. One way to measure changes in the amount of fluid in the upper body is to measure corresponding changes in the circulatory system. As fluid volume increases, scientists have predicted that more pressure than usual should be exerted on the upper body veins; as upward fluid flow decreases, the pressure should equalize. Spacelab 1 investigators tried to determine the degree and rapidity of the fluid shift by measuring central venous pressure in the arm veins of four crewmembers. Before this mission, no direct measurements of venous pressure were available to test the hypothesis. Surprisingly when venous pressure was measured 22 hours into the mission, it was lower, not higher, than preflight measurements. One hour after landing, venous pressures were high for all four crewmembers, indicating fluid shifts associated with the body's readaptation to Earth. Astronauts use the echocardiograph to record images of the heart as the body adapts to microgravity. This experiment was repeated using four different subjects on the Spacelab D1 mission with measurements made as early as 20 minutes after launch. Even with early measurements, the venous pressure was still lower than the preflight measurements, confirming the Spacelab 1 results. The investigator was astonished at the low pressure level so early in the mission before any dehydration was possible. From these results, investigators concluded that the fluid shift is a highly dynamic process that may occur even before launch when crewmembers spend about 2 hours seated in the Shuttle on the launch pad. To confirm this hypothesis, investigators want to make measurements during this waiting period along with measurements of hormones that regulate fluid balance. A novel device for noninvasively measuring venous pressure may help clarify the profile of fluid shifts by enabling more frequent and convenient measurements. Limited measurements with the device, which was tested on the 61-C mission, confirm the Spacelab 1 and Spacelab D1 results. Red blood cells, which are the focus of the hematology studies, transport oxygen throughout the body. Spaceflight studies indicate that red blood cell mass is reduced in microgravity. Several theories as to why this happens have been developed. One of the most generally accepted is that bone marrow function is inhibited; this results in the suppression of erythropoietin, a hormone that stimulates red blood cell creation. A Spacelab 1 investigation studied the relationship between decreases in erythropoietin and red blood cell mass by analyzing blood samples from four crewmembers taken before, during, and after flight. While there was a significant decrease in red blood cell mass and reticulocytes, erythropoietin seemed not to vary significantly. More studies are needed to determine if the body destroys red blood cells or if other mechanisms influence red blood cell counts. Another important type of cell, lymphocytes (white blood cells), may also be altered in microgravity. Lymphocytes help the body resist infection by recognizing harmful foreign agents and eliminating them. Some evidence from previous space studies suggests that the number and effectiveness of white blood cells are reduced in space crews, and thus the ability to fight infection is altered. However, astronauts have not shown an increased susceptibility to disease, and lymphocyte counts return to normal a few weeks after landing. The shift of body fluid toward the head during spaceflight may initiate cardiovascular adaptation to space. Determining venous pressure by measuring blood flow in the jugular vein may help to define the timetable for fluid shifts and space adaptation. Biologists are studying the effects of microgravity on red blood cell development. The arrow in this electron microscope image (magnification 1,600 times) shows a reticulocyte, a young developing red blood cell, surrounded by mature red blood cells. The electron microscope images (magnification 6,000 times) show several shapes assumed to result in an increase in unusual shapes. The upper left quadrant shows a normal red blood cell shape, and the lower left shows an echinocyte, a rare shape. Normally, very few echinocytes are found in the blood, but in samples obtained from Spacelab 1 crewmembers a week after landing, more of these cells were found than usual. An intermediate stage in the transformation is shown at the upper right and even rarer cell than the echinocyte is shown at the lower right. ....and finally proliferate to produce sufficient amounts of the antibody. Immune cells cultured during Spacelab 1 lost almost all ability to respond to foreign challenge. Cultures grown in space and controls grown on the ground were injected with mitogen, an agent that causes lymphocytes to activate and reproduce rapidly to fight infection. Proliferation of the flight lymphocytes was less than three percent of that for ground lymphocytes. Although the flight cells were clearly alive, they did not activate and respond to the stimulus. This experiment was repeated on the D 1 mission with cultures exposed to microgravity, cultures on a 1-g centrifuge, and with blood taken from the crewmembers during the mission. Cultures grown on the 1-g centrifuge, which simulates terrestrial gravity, were important controls because other factors besides microgravity (such as radiation) were still candidates for altering the cells' response. 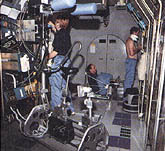 The samples taken from the crew were important because only cultures of lymphocytes had been studied during Spacelab 1. The Spacelab D1 results confirmed the Spacelab 1 results: cell activation in the cultures exposed to microgravity was depressed when compared to control cultures on the centrifuge and on the ground. Since cells on the 1-g centrifuge responded normally, it appears that microgravity is the dominant factor inhibiting cell activation in space. In addition, activation of lymphocytes from the crewmembers was markedly depressed in samples taken in flight as well as in samples drawn an hour after landing; the activation process in crewmembers' white blood cells did not fully return to normal until 1 to 2 weeks after landing. These two experiments made it clear that microgravity almost completely inhibits the process of lymphocyte activation. In conjunction with other Spacelab D1 results indicating increased proliferation and antibiotic resistance of bacteria in microgravity, these results suggest a risk of infectious disease, which must be taken seriously in planning spaceflights. The next step is to discover which stage of the activation process is affected and determine if the effect can be prevented. A complementary Spacelab 1 experiment indicates that immunoglobulins (key antibodies) appear to function normally in space. In blood samples from four crewmembers, only minor fluctuations in quantity were measured with no significant effects recorded during the 10-day flight. From these results, one might conclude that activated lymphocytes continue to produce antibodies during prolonged weightlessness and are not affected by microgravity. However, microgravity may impair the lymphocyte activation process, altering the immune system's ability to respond to challenges. The muscles and bones, the support structure of the body, evolved under the influence of gravity and now require gravity for normal functioning. In the absence of gravity, muscles may deteriorate and bones may become smaller and weaker. Previous space crews have shown loss of lower body mass, especially in the calves, decreases in muscle strength, and negative calcium balances. The process occurring in space resembles the initial phases of some bone diseases or the wasting away of muscle and bone observed in bedrest patients. Thus, a better understanding of this process in space also will aid research on Earth. During the Spacelab 2 mission, investigators measured vitamin D metabolites, which regulate calcium in the bones and blood stream. Three vitamin D metabolites were measured in blood samples taken from four crewmembers before, during, and after flight. Levels of two metabolites remained essentially unchanged. However, the level of a third metabolite underwent an interesting pattern: there was a rise in the level in blood samples collected early in the mission, which dropped in samples taken on mission day six and returned to normal post flight. Measured values remained within a normal range at all times, but the pattern exhibited in all four crewmembers needs further examination. All of Spacelab 3 rodents adapted readily to microgravity and were returned to Earth in good health, but they experienced losses of muscle and bone mass and altered hormone production. Muscle mass in the legs appears to decrease in microgravity. This sock is used to measure changes in leg volume associated with fluid shifts from the lower to upper body. ....mass in the legs, that also have been reported by astronauts. Some of the most notable phenomena measured in the rodents were a dramatic loss of muscle mass, increased bone fragility, and bone deterioration. As with humans, the long gravity-sensitive muscles in the rodents' legs and spines seemed to be most affected; some leg and neck muscles lost up to 50 percent of their mass. A hormone change measured in the rodents may be associated with the observed loss of muscle and retarded bone development. Although the pituitary glands of these animals showed an increase in growth hormone content, the release of the hormone appeared to be impaired. This resulted in substantially lower growth hormone synthesis for flight rats than for ground controls. Such indications of a response to microgravity at a cellular level are intriguing and require further investigations. The neurovestibular system, which includes our reflex, vision, and balance organs, appears to be very sensitive to gravity. Space motion sickness, which has affected about half of all space travelers, may be a result of this sensitivity. Symptoms of space sickness include lack of appetite, nausea, and vomiting. Symptoms are similar to motion sickness, but scientists are unsure if the stimulus is the same because crewmembers who are susceptible to motion sickness on Earth may not experience space sickness and vice versa. There is still no good model for predicting whether individuals will experience discomfort as they adapt to space. Luckily the body adapts quickly, and the most severe symptoms occur during the first days of spaceflight. Although some medications have been used successfully to reduce the symptoms, no treatment eliminates these discomforts. Experiments have focused on identifying the underlying causes of the problem and ways to treat it. A physiological tape recorder worn by Spacelab 1 crewmembers recorded continuous measurements of brain and heart activity and eye and head movements. Results indicate that head movements and visual disorientation provoke space motion sickness. 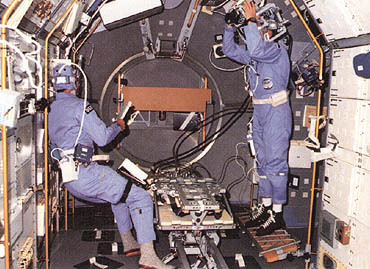 During the Spacelab 1 mission, a group of complementary experiments sponsored by American, Canadian, and European scientists studied the vestibular system from a variety of angles to determine how the sensory motor system adapts to weightlessness. This research focused on the inner ear organs (especially the otoliths) which sense gravity and linear acceleration. The experiments also examined the interrelated functioning of the inner ear, vision, and reflexes - all of which help us orient ourselves. Before the mission, investigators proposed a "sensory conflict" theory: in microgravity, information sent to the brain from the inner ear and other senses conflicts with the cues expected from past experience in Earth's 1-g environment, resulting in disorientation associated with space adaptation syndrome. 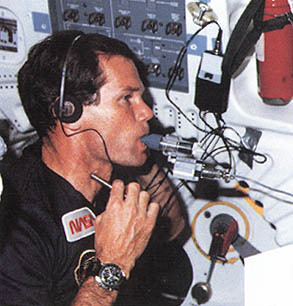 During the Spacelab 1 mission, three of four subjects developed space motion sickness. The astronauts made detailed reports on the time course of symptoms while their head movements were monitored with accelerometers. These reports were the first detailed clinical case histories of space sickness available for study. 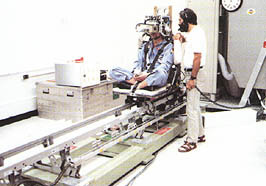 As expected, head movements were reported to provoke episodes of space sickness, but the Spacelab 1 crew also documented the important role played by vision in the adaptation process. Crewmembers frequently experienced a spontaneous change in perceived self-orientation if they reinterpreted the location of various static landmarks or if another crewmember came within view in an unfamiliar orientation. As with head movements, these visual reorientation episodes provoked space sickness. These findings fit the sensory conflict theory, which predicts confusion over actual versus expected sensory cues. Other experiments examined different outputs to reveal how the central nervous system adapts to microgravity. A rotating dome, a drum with dot patterns that fits around the face and produces a sensation of bodily motion, was used to stimulate eye movements and body reactions. Subjects reported stronger visual effects in space than on the ground, which suggests a greater reliance on vision while signals from the otoliths are ignored or reinterpreted. On the 41-G and Spacelab 1 missions, subjects experienced some visual illusions as they performed prescribed movement tests. Other tests measured the subjects' changes in perception when blindfolded in weightlessness. When crewmembers viewed various targets and then pointed at them while blindfolded, their perception of target location was very inaccurate in flight compared to similar tests on the ground. In a test of the ability to perceive mass in microgravity, subjects were much more inaccurate in predicting masses in weightlessness than in predicting weights and masses in preflight tests. The hop and drop experiment studied the otolith spinal reflex which normally prepares one to land after a fall. Results indicate that otolith-spinal reflex response was inhibited in microgravity. ...elastic cords to the crewman to pull him downward). The normal reflex was inhibited when tested early in flight, declined further as the flight pro greased, but returned to normal during tests conducted immediately after landing. Again, this suggests that in microgravity the brain ignores or reinterprets otolith signals. Spacelab 1 experiments studying the vestibulo-spinal reflex mechanisms measured changes in the spinal reflexes and posture associated with the vestibular system. The subjects' physiological responses to standard posture and reflex tests were recorded. Results of these tests indicate that posture is modified dramatically in weightlessness, and the individuals whose central nervous systems are better able to modify response patterns may experience less severe symptoms of space motion sickness. A related French experiment on the 51-G mission revealed changes in muscle movement and the role of vision during postural control. Pre- and postflight Spacelab 1 tests using a sled to accelerate subjects along a linear path indicated that subjects had an increased ability to perceive linear motion after exposure to microgravity; this seems to indicate that signals sent from the otoliths, which sense both gravity and linear acceleration, come to be interpreted by the brain as only linear motion. 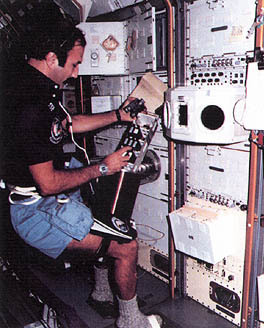 To increase the number of subjects for statistical studies, some of the Spacelab 1 experiments were modified and reflown aboard the Spacelab D1 mission. These included the space motion sickness studies, the rotating dome experiment, and the hop and drop experiment. Although the Spacelab D1 results are still being analyzed, they generally confirm the Spacelab 1 findings. Spacelab D1 repeated some of the Spacelab1 vestibular experiments to increase statistical samples and used a linear acceleration sled (center aisle of module) in orbit for the first time. Tests with acceleration sleds are used to study our perception of and sensitivity to linear motion. A sled developed by the European Space Agency was flown in space for the first time on the D1 mission. When subjects were accelerated on the sled in flight, without the influence of gravity, they had smaller increases in sensitivity to linear motion than the investigators expected. Postflight D1 sled experiments confirmed the earlier Spacelab 1 postflight sled tests, with subjects continuing to show slight increases in sensitivity to linear accelerations. 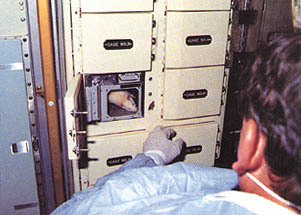 Spacelab 3 results indicated that other mammals may also experience space motion sickness. The two monkeys flown on the mission were carefully observed by trained biologists. The monkeys' patterns of food intake and behavior indicated that while one animal reacted normally throughout the mission, the other had low food consumption for the first four days of flight followed by recovery during the last three days of the mission. Both monkeys' behavior and food consumption were normal upon landing. This suggests that squirrel monkeys may serve as good surrogates for studying space motion sickness. 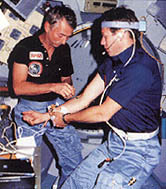 Another Spacelab 3 experiment tested the effectiveness of the combined use of autogenic and biofeedback training as a countermeasure to space motion sickness. Preflight, two crewmembers were trained to gain voluntary control of their heart rate, skin temperature, and finger pulse rates. Two other crewmembers who served as controls did not receive training. During the flight, each of the four crewmembers wore an undergarment equipped with electrodes and sensors for measuring heart rate, body temperature, skin response, and breathing rate. For the first time during a Shuttle flight, these physiological parameters were recorded continuously during the astronauts' working hours. 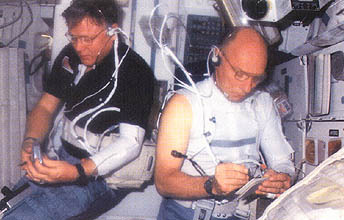 Spacelab 3 crewmembers wore undergarments outfitted with physiological monitors and kept logs of space motion sickness symptoms. Although the statistical sample is small, postflight analysis of crew logs and physiological data indicate that one crewmember who learned to control the motion sickness symptoms with autogenic feedback training preflight was able to use these skills to control minor symptoms experienced in flight. This crewmember never developed any severe symptoms during the mission. The other crewmember who demonstrated less skill with the autogenic feedback training technique reported one severe episode of space motion sickness. The two control subjects (who took anti motion sickness medication) reported multiple symptom episodes during the first day of the mission. Symptoms for all four subjects subsided after the first day in space. More subjects need to be tested, but initial results seem to indicate that preflight improvements in motion sickness tolerance can be used to predict success in controlling symptoms in flight. Microgravity also enabled investigators to make a discovery about the inner ear. Since the last century, it has been known that irrigation of the ear canals with water at a temperature higher or lower than body temperature causes nystagmus - rapid involuntary eye movements. This test is important for the clinical diagnosis of sensory problems. According to previous theory, these eye movements are caused primarily by thermal convection in fluid in the semicircular canals of the inner ear. In space, it is possible to test this hypothesis since thermal convection is inhibited by the virtual absence of gravity. When the test was done with two subjects during Spacelab 1, both responded with eye movements. Thus, the presence of caloric nystagmus in microgravity demonstrates that mechanisms other than thermal convection are involved. By studying life in a microgravity environment, scientists can see functions that are masked by gravity on Earth. Space is a good laboratory for determining what role gravity plays in certain basic life processes. These experiments contribute significantly to our understanding of life as well as to the fundamental bank of biological and medical knowledge. The functions and processes of single cells as well as transactions between cells often lead to changes on a larger scale in an organism. This was evident in the white blood cell experiments described earlier, which suggested that responses by these cells to microgravity may alter the human immune system's ability to fight infection. Even the study of the simplest life forms such as bacteria can demonstrate how cells respond to microgravity and other conditions of the space environment. Spacelab is ideally suited for cellular studies because samples are small enough to be observed and manipulated in relatively large numbers, and they can be preserved and returned to Earth for detailed analysis. Cell cultures and other samples on Spacelab D1 were carried in the European Space Agency (ESA) Biorack. .... preserving specimens in orbit. The D1 mission was the first Spacelab mission in which specimens were "fixed" in orbit; this fixation allows specimens to be preserved while they are under the influence of microgravity and eliminates influences such as accelerations during landing and adaptation upon return to Earth. To further isolate the effects of microgravity from other space conditions (radiation, vibrations, launch, and landing), most of the D1 experiments used controls in 1-g centrifuges that simulate terrestrial gravity; thus, effects seen in microgravity specimens that are not seen in 1-g specimens may be more strongly linked to gravity. Several Spacelab D1 experiments studied bacteria, the simplest life form on Earth. Under favorable conditions, these single-celled organisms, not much more than one thousandth of a millimeter in length, reproduce rapidly by repeated cell divisions. This rapid reproduction makes bacteria excellent for studying cell development and proliferation. Two Biorack experiments confirmed an observation made on several previous flights: bacteria reproduce more rapidly in space. This finding suggests that in space humans may be exposed to greater risks of infection. This additional risk also is suggested by another D1 experiment with E. coli, a common pathogenic organism. Under microgravity conditions, the bacteria showed an increased resistance to antibiotics. The fact that microgravity seems to influence bacteria reproduction also may prove useful. Some bacteria have a primitive form of sexual behavior in which two cells exchange genetic material  through a physical bridge between them. A laboratory technique derived from this phenomenon can be used to introduce human genes - for example, genes needed for insulin production - into bacteria that then can synthesize a useful product. A Spacelab D1 experiment showed that this transfer of genes can occur three to four times faster in microgravity than in 1-g; in space, bacteria may be able to produce biological products more rapidly. Cell differentiation, the process by which originally similar cells acquire different capabilities, was studied aboard Spacelab. In higher organisms, this process leads not only to the pro auction of cells as different as skin and nerve cells but also to the production of cancer cells from normal cells. Under certain conditions, many bacteria become dormant by forming spores, which are genetically identical to the active form but function differently. This makes sporulation a simple model for studying cell differentiation. A Spacelab D-1 experiment observed a reduction in sporulation and thus differentiation for bacteria. However, the 1-g centrifuge control for this experiment failed, and therefore the experiment needs to be repeated to deter mine whether the reduction was due to microgravity or other space conditions. Many organisms other than bacteria consist of single cells, but the cells are much larger (10 to 100 times the size of bacteria) and more complex, possessing a variety of internal structures that perform most of the functions of the organs of higher animals and plants. Like bacteria, many of these organisms proliferate via repeated cell division. Two experiments, one with paramecia and one with green algae, revealed that, as with bacteria, microgravity increased the rate of cell proliferation. In microgravity, the paramecia increased four times faster than the controls. The investigator hypothesized that since the paramecium is a swimming cell, it may use less energy for movement in microgravity and use the extra energy for other activities such as cell proliferation. Micro-gravity may affect the development of life from embryo to adult. One Biorack experiment with the much studied fruit fly revealed that microgravity reduced the rate of development of eggs to 10 percent of the normal, rate. Surprisingly, the total number of eggs laid was higher, but the hatching and development rates were reduced. The lifetime of each fly also was measured. While the female flies had the same life span as the control groups, the life span of the male flies was reduced by one-third. This phenomenon needs to be studied more to determine whether shorter lives may be related to the general speeding-up of vital processes observed in unicellular organisms. Development also seemed to be inhibited in stick insect eggs. During development, this insect passes through several stages differing in radiation sensitivity. Layers of eggs at five different stages of development were sandwiched between radiation detectors so that investigators could detect heavy ions of high energy and charge as they penetrated an egg. This allowed investigators to study the effects of microgravity and radiation on development. The response to the spaceflight environment varied depending on the stage of development of the eggs. When eggs at late stages of development were hit by a radiation particle, they tended to develop normally. However, a significant reduction or delayed hatching occurred in eggs that were in an early developmental stage when hit by a particle. Development was impaired to a lesser extent in those eggs that were developed in microgravity but were not hit by a particle. Hatching was normal for both hit and non-hit eggs on the 1-g centrifuge, indicating a difference in radiation response depending on gravity environment. During development of the larvae, additional damage - such as reduced life span and increased body abnormalities - was observed in individuals hatched from radiation-exposed eggs in the microgravity samples. Another experiment studied the development of the vestibular system in tadpoles hatched in space. On Earth, most species develop organs to orient themselves in a gravitational field and coordinate movements. Tadpoles hatched from frog embryos flown aboard the Spacelab D1 mission showed pronounced alteration in swimming behavior upon return to Earth. They swam in small circles around fixed centers until their behavior normalized two days after landing. Later examination of the morphology of the tadpoles' vestibular gravity receptors revealed no structure, deformities, indicating that the vestibular system developed normally for the embryos in space. These results correspond with earlier experiments on amphibians and rodents. On Earth, most organisms have behavior patterns that correspond to 24-hour cycles. Debate continues over whether these circadian rhythms are regulated by internal biological clocks or by outside influences such as day-night cycles, seasonal changes, gravity, or the Earth's rotation. For a spacecraft orbiting Earth, there are 16 sunrises and sunsets in a 24-hour period, the Earth's rotation and seasons are eliminated, and there is virtually no gravity. This give s scientists the opportunity to examine circadian rhythms in the absence of normal external cues. The ten distinct bands seen in each tube of neurospora grown on Earth (a) are evidence of circadian rhythms. The pattern of spaceflight cultures (b) is visibly different from the cultures grown on Earth. The clarity of banding in the spaceflight cultures is reduced, but banding patterns are clearer near the right end of each tube where growth occurred after the tubes were exposed to light. These results suggest that circadian rhythms persist in space but may be altered. During Spacelab 1, the biological clock theory was tested by examining growth patterns of neurospora, a common fungus. If cultures of neurospora are transferred from constant light to constant darkness, a distinct banded growth pattern is evident that indicates when vegetative spore formation occurs. This experiment produced some confusing but interesting results. The pattern of cultures grown in space was visibly different from the cultures grown on Earth. Growth rates and circadian rhythms varied among the seven cultures grown in space, and the clarity of the banding pattern was reduced. However, after the cultures were moved for marking and exposed to light, robust rhythms were evident in all the sample tubes. The clear pattern seen in all cultures after the tubes were marked proves that the rhythm can persist in space. The damping out of the pattern during the first 7 days of the mission indicates that outside factors probably do influence the biological, clock's expression. Pine seedlings grown in microgravity had less lignin a structural fiber that helps plants grow upright in spite of gravity. Some plants may be more useful as food and industrial products if their lignin content can be reduced. ...mold moved with the same biological periodicities, indicating the operation of the biological clock, but the behavior was somewhat altered with the velocity of the protoplasm increasing in microgravity. From preliminary Shuttle/ Spacelab experiments, biologists have learned about the fundamental behavior of plants and how to grow and maintain them in orbit. Sunflowers were the first plant to be flown aboard the Shuttle; on STS-2 and STS-3, sunflowers were grown to test a new plant growth apparatus and at the same time  confirm that water delivery to plants is basically the same in microgravity as on Earth. For the Spacelab 1 mission, sunflowers were studied again to resolve a question about a peculiar circular growth movement called nutation. As plants grow on Earth, their tips describe a helix around a central, axis. Plant physiologists have wondered whether this movement depends on gravity or on an internal growth mechanism. 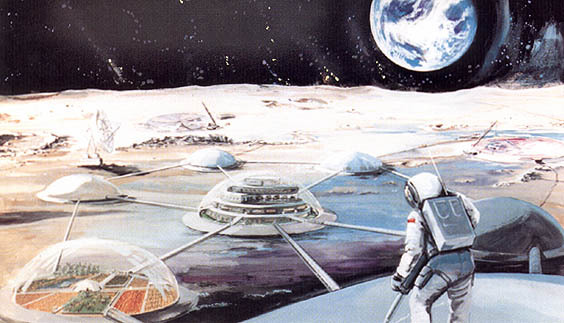 Theories predicted that nutation would virtually cease in microgravity. 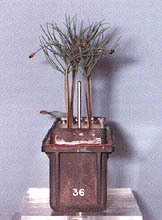 During Spacelab 1, plants were observed by time-lapse video, and the nutation proceeded. Although the nutation of the microgravity plants varied somewhat from the ground controls, the fact that nutation occurred suggests that the response is influenced by other mechanisms rather than triggered by gravity alone. 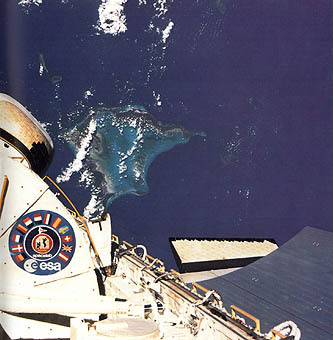 Plant experiments with mung beans, oats, and pine seedlings were conducted on two Shuttle flights (STS-3 and Spacelab 2). These experiments studied the ability of plants to synthesize lignin, a structure, fiber that plants use to grow upright against gravitational force. Lignin, though useful for rigidity, is difficult to digest and is detrimental in some industrial processes such as making paper. Scientists think that if lignin content could be reduced in some plants, the plants would make better food and industrial products. Lentil roots grown in microgravity (a) were oriented randomly, whereas roots grown in space on a 1-g centrifuge (b) grew in the direction of the acceleration. Roots grown in microgravity (c) were disoriented but did not seem to lose their ability to perceive gravity because when placed on 1-g centrifuge (d), they grew in the direction of accelerations that simulated gravity. ...lignin synthesis as well as a slight overall growth reduction for the stems and leaves. To see if this trend continues or is enhanced with plant development, this experiment should be repeated with more mature plants. Interesting plant behavior was also observed: many of the mung beans and oats had roots emerging upward out of the soil. This indicates that, in the absence of gravity, plant growth may be disoriented. The mechanism by which plants know which way to grow is still a matter of controversy. In a Spacelab D1 experiment, lentil seeds were germinated in microgravity and on a 1-g centrifuge. The microgravity-grown roots grew down into the soil but were not oriented correctly. 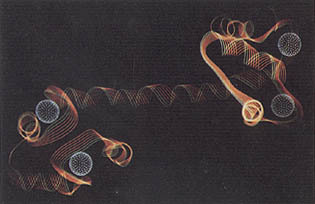 However, the plants demonstrated that the ability to sense gravity-like accelerations was not permanently lost. 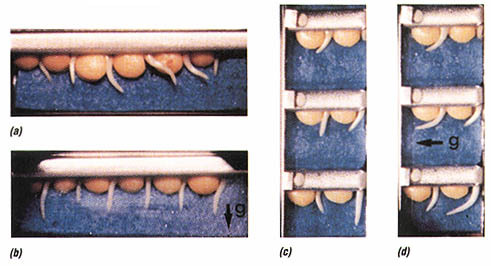 When placed on a 1-g centrifuge, the plants oriented their roots in alignment with the accelerations. For maximum benefit, tissues from the sunflowers, oats, and mung beans were shared with other scientists for some interesting genetic and structure, studies. Chromosomal studies of the sunflower and oat root tips showed several abnormal chromosomes and depressed cell division. Plants grown on the ground had twice as many cells in division as the plants grown in flight. The oats had broken and fractured chromosomes more severe than any in ground controls. These results indicate that microgravity and/or other spaceflight conditions, such as radiation, may damage the cell's genetic material. Other aspects of the space environment such as high radiation and vacuum affect life in space. The hazardous environment of space includes unfiltered ultraviolet radiation, X-rays, gamma rays, and high-energy particles (electrons, neutrons, protons, and heavy ions) that do not reach Earth's surface because they are either deflected by the geomagnetic field or absorbed in the atmosphere. Because astronauts work outside to service satellites and build space structures, it is important to characterize radiation levels under varying conditions. Heavy particles with high energies and charges (HZEs), which are relatively rare but very penetrating and damaging, are of special interest because they are poorly understood and can penetrate spacecraft shielding. To measure radiation effects on living organisms, a Spacelab 1 experiment used biostacks, single layers of organisms sandwiched between thin foils of nuclear track detectors. A variety  of organisms that differed in size, position in the stack, organizational level, developmental stage, and radiation sensitivity were flown. These included single cells, developing eggs, spores, and seeds. Some biostacks were placed inside the Spacelab module and others were directly exposed to space on the pallet. By comparing the tracks of high-energy particles on the detectors with the biological samples through which they passed, investigators could correlate the effect of radiation on a single cell. Results indicate that single high-energy particles can induce dramatic changes in individual cells, such as genetic damage and death. A related Spacelab D1 experiment with stick insect eggs sandwiched between biostack particle detectors indicated that the HZE particles produced different degrees of damage at various development stages. Interestingly, the effects of the radiation were enhanced in eggs exposed to micro gravity and less damaging in eggs kept on a 1-g centrifuge. In other radiation measurements, severe, detectors both inside and outside the Spacelab 1 module measured doses of radiation three times higher than those measured during other Shuttle missions. Although the radiation dose was relatively benign and did not endanger the crew, investigators attributed the higher radiation level to the higher inclination orbit. (Spacelab 1 was the first mission with a 57 degree inclination rather than the 28 to 40 degree orbits for previous missions.) Scientists had predicted that there would be higher electromagnetic and particle radiation fluxes at higher inclination orbits. Further study is warranted before we embark on long-term missions at higher altitudes and inclinations. The effects of vacuum and ultraviolet radiation were also studied on Spacelab 1. Spores exposed outside on the pallet formed 50 percent fewer colonies and had 10 times more mutations than samples grown under normal atmospheric conditions. Life sciences research not only prepares us to live and work in space but also may improve life on Earth. Bioprocessing in space is a new discipline of growing importance. It is closely related to understanding how cells function in gravity since many of these cells make useful products. Early experiments have focused on developing the apparatus and techniques for processing biological substances. Protein crystal growth in space has been especially interesting because of the potential applications for determining the three-dimensional structure of proteins. Many of the molecules essential for living organisms -especially proteins and nucleic acids - have extremely complicated three-dimensional structures, many of which are unknown. To decipher these structures, crystallographers coax biological, molecules to organize symmetrically into crystals big enough to study and then bombard the crystals with X rays to create patterns which computers can analyze. Molecular biologists need this information to understand the complex functioning and interrelationships among biological materials and organisms. Knowing the exact architecture of hormones, enzymes, and other proteins enables scientists to bypass years of tedious trial-and-error experimentation in efforts to design new and more effective drugs and to produce improved synthetic proteins for industrial applications. Currently, X-ray crystallography is the only technique available for elucidating the atomic arrangements within complicated biological molecules, and this method requires well-formed, large, single crystals of the compounds being studied. On Earth, convection and turbulence during crystal formation disrupt the internal crystalline structure, and sedimentation causes crystals to clump together instead of forming distinctly. One of the great bottlenecks in protein crystallography has been the inability to produce large, pure crystals for analysis. Fortunately, experiments aboard the Shuttle and Spacelab missions indicate that much larger and higher quality crystals can be grown in space where microgravity inhibits convection and crystals float freely in solution rather than clump together. In a Spacelab 1 experiment, two enzymes were crystallized: beta-galactosidase (a key genetic ingredient) and Iysozyme (a basic protein that is well-studied). In both cases, the crystals grown in orbit were much larger and purer than those grown in the same apparatus on the ground. This successful experiment sparked a united effort by a team of scientists who developed an apparatus for growing protein crystals in space. Protein crystals have been grown on four Shuttle flights by a vapor diffusion technique. During the most recent  experiments aboard the 61-C mission, crystals were grown of these proteins: Iysozyme, a protein from hen egg white with a well-known structure that can be used to compare the quality of ground- and space-grown crystals; bacterial purine nucleoside phosphorylase (PNP), a protein (with an unknown structure) used for synthesis of anticancer drugs; human C-reactive protein (CRP), a major component of the human immune system; human serum albumin, a protein known to bind and transport a number of important biological molecules as well as certain drugs; and canavalin and concanavalin B, two proteins that have well-known structures for modeling and are of interest in protein engineering to improve the nutritional value of food sources. These crystals of purine nucleoside phosphorylase (PNP) grown in space are large enough to analyze by X-ray crystallography. If the structure of PNP (shown in this computer model) can be defined, the information may help in designing anti-cancer drugs. ...attached crystals. In the case of human C reactive protein, a crystal form that had not previously been identified in ground-based experiments was obtained first aboard the Shuttle and has since been produced on the ground. The internal structures of some of the space crystals appear to be more ordered; however, before this can be thoroughly assessed, more detailed comparisons with large numbers of crystals grown under well-controlled conditions on Earth and in space are necessary. Based on these preliminary results, a larger protein crystal growth facility with a more controlled environment is being developed for future missions. Materials scientists and biologists are collaborating on other projects, including the Continuous Flow Electrophoresis System (CFES) project which is a joint endeavor between NASA and private industry. The objective of this program is to separate and purify biological substances for pharmaceutical purposes. Substances processed on several Shuttle flights are currently being evaluated by a pharmaceutical company. Even though we have more than a quarter century of manned spaceflight experience, fundamental questions remain about the immediate and long-term effects of space on humans and other organisms. As we experiment in space, we answer some questions but are left* with more "unknowns." 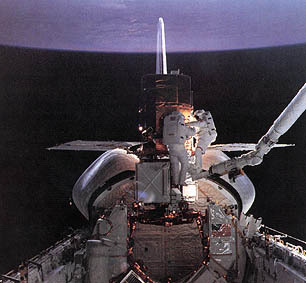 The Shuttle and Spacelab experiments have been pathfinders, addressing important questions, developing equipment and techniques for research, and leading to discoveries impossible to detect in the gravitational environment on Earth. There are still many life sciences experiments waiting for sorties aboard the Shuttle/Spacelab, while others are being developed for long-term stays aboard the Space Station. The data obtained so far indicate a  fascinating pattern: all living organisms from microbe to man are influenced by gravity. It is built into our very cells, tissues, and organs in myriad overt and subtle ways. Discrete experiments flown aboard the Shuttle can be integrated aboard the Space Station so that scientists can collaborate to study organisms as a whole and determine how gravity influences an organism through its entire life and in subsequent offspring. Aboard the Space Station, life scientists will team up with materials scientists, Earth scientists, and astrophysicists to explore life from the micro to macro level. Materials scientists will develop better protein crystals and purer biological specimens, which life scientists can analyze to determine the structure of life. With photographs and infrared maps from Earth-orbiting platforms and satellites, biologists can understand the interaction of Earth and its environment on a global scale. They can correlate biological, geological, chemical, and oceanographic data to determine how changes (increased industrialization, land clearing, oil spills, etc.) propagate to neighboring areas in the biosphere. Before long-term space missions, many aspects of human physiology and psychology must be examined. A Spacelab 1 experiment studied the payload specialists' abilities to estimate varied masses in microgravity. Biologist crewmembers practice experiments for future life science missions. The Space Station will offer life scientists, chemists, and astrophysicists a chance to do unique experiments in exobiology, the study of the origin, evolution, and distribution of life in the universe. Astronomers already have detected the essential biochemicals (carbon, nitrogen, oxygen, phosphorus, sulfur, etc.) light-years away from Earth. The Space Station will have an unobstructed view of the solar system, comets, meteorites, and asteroids which may contain molecules and chemical fragments of biological significance. Continuous viewing of the universe from the Station and orbital observatories increases our chances of finding other planets and perhaps other life in the universe. The Station can be used as a platform for huge cosmic dust collectors, allowing biologists to examine particles from interstellar space for biogenic elements and maybe even simple organisms. The study of life in our solar system will be augmented by manned and unmanned planetary expeditions. Through NASA's Controlled Ecological Life Support System (CELSS) program, scientists are working to develop life support systems for spacecraft that can process wastes, recycle air and water, and support the cultivation of plant and animal food sources. This type of spacecraft, which will be used for long-duration missions where resupply from Earth is impractical or impossible, will make deep space accessible to human exploration. Space must be a comfortable and productive workplace. We are still largely ignorant of the mechanisms and limits of human adaptation to prolonged spaceflight. Scientists must determine how humans and other organisms adapt to the space environment and develop sound countermeasures to detrimental effects. Human factors and physiological experiments will be conducted to design the Space Station as well as other space workstations for safety, efficiency, and comfort. There is still much to be accomplished before space becomes our home and workplace. The Shuttle will continue to be a testbed for advanced equipment. A series of dedicated Spacelab Life Sciences (SLS) missions staffed by expert biologists is already planned for the next decade. By dedicating a mission to one discipline, it is possible to integrate experiments and explore a spectrum of related data. A series of International Microgravity Laboratory (IML) missions shared by materials and life scientists will carry valuable experiments and has already enabled an international working group of scientists to establish a solid base for sharing ideas and results. Results from the Shuttle and Spacelab missions have blazed the paths of exploration, and we are beginning to make space an extension of life on Earth. F.M. Sulzman, NASA Headquarters, Washington, D.C. Gravity Influenced Lignification in Higher Plants.